WFRP is a game that emphasises the roleplaying aspects of the roleplaying hobby over the Hack'n'Slay attitudes of some other games. It's balanced realism means any characters who attack first and ask questions later will discover it's gritty realism the hard way and it is almost unique in it's extensive system of career development, while the detailed background is probably at least partly responsible for it's continued popularity despite being ten years old and the basic rulebook never having been revised or updated in any major way. WFRP was first spawned in 1986 as a roleplaying extension by Games Workshop (note: The GW site and it's many pages below are quite graphics intensive) to their game of Warhammer Fantasy Battle (WFB). As more and more of GWs profits came in from the miniatures used in WFB and its futuristically set sister, Warhammer 40,000 (WH40K), their interest in WFRP waned. GW had soon realised that WFRP had to be a game in its own right, distinct from WFB from which it had been spawned (oh yes, and WFRP didn't sell many miniatures...). It was this very fact that allowed GW to separate its business into two distinct parts, splitting the WFRP side of things into a daughter company called Flame, whose job it was to try and make WFRP profitable. Flame failed. The reason why will probably never be known for sure, but was probably due in part to the strict restrictions that GW are said to have placed on Flame. They limited, for example, Warhammer Companion (a WFRP supplement largely unavailable and out of print now) to a print run of 3000 copies (or there abouts). Such small print runs (Warhammer Companion reportedly sold out within weeks) almost undoubtedly contributed to Flames eventual demise. A list of all the books GW and/or Flame released is here , courtesy of warhammer.net. But the story doesn't end there. Although doing nothing with it, GW kept WFRP under its belt for a few years. During that time, no supplements were released for it and in time only a core of dedicated enthusiasts were to remain. This core got together and a number of projects were started, including the Norsca project and Miragliano project. Many of these projects none the less died, but some, like the two just mentioned, did succeed, a topic which will be returned to later. Apocrypha Now! - a reprint of various articles in out of print Flame supplements and GW's magazine, White Dwarf. Dying of the Light - HHs first entirely new supplement, an adventure set in and around Marienburg. It was written by multiple authors, each writing a chapter, and met with somewhat mixed appeal, and some regarded it as being too linear. It rapidly went out of print. Shadows over Bogenhafen - a reprint of the first two parts of possibly the most famous WFRP campaign The Enemy Within. Fire and Blood - a reprint incorporating the first two parts of Flames' Doomstones campaign, Fire in the Mountains and Blood in Darkness. Death on the Reik - a reprint, continuing the Enemy Within campaign started in Shadows over Bogenhafen. A WFRP GM Screen, with a nice computer generated map of the Old World on one side, and all manner of useful WFRP tables on the other. It also came with booklets that included some nice Critical Hit tables for blunt weapons, energy weapons. etc., a WFRP calendar planner chart, and an index to the WFRP rulebook. Wars and Death, the second part of the re-released Doomstones campaign, reprinting the old Flame Dwarf Wars and Death Rock. 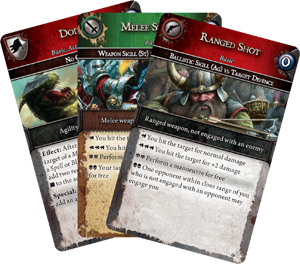 Middenheim: City of Chaos - a reprint of the Flame/GW publication. Power Behind the Throne - ditto, continuing the Enemy Within campaign and including a new extra adventure called Carrion up the Reik, joining Death on the Reik and Power Behind the Throne. A re-printed Something Rotten in Kislev from the Enemy Within. The excellent new Marienburg: Sold Down the River sourcebook, regarded as probably Hogsheads' best released WFRP book. Deaths' Dark Shadow - a re-print of the old Flame book. Hogshead, under Mark Ricketts, appears unlikely to seek the licence to publish WFRP again. They apparently now have a view towards producing D20 compatible roleplaying games of various guises - more information here. a games company and is currently producing top-notch WH novels for BL..."
It goes on to say that at the time of the announcement that a decision by Black Library was still pending on what exactly to do with WFRP. WFRP is like Chaos itself - it wouldn't die - and seems to have a few Fate Points up its sleeve yet. Hopes for a revival of the game passed to a decision by Black Library, and to hopes of a revival tied to GW's forays into the world of MMO's (Massively Multiplayer Online games, for the uninitiated) and in particular their MMORPG of Warhammer Online, , which was in development from about 2001 to 2004 (and whose release was planned for about 2005). Warhammer Online was being created by Games Workshop with in collaboration with games developer Climax and games distributor SEGA. Over that time up to 2004, there was considerable interest in Warhammer Online, and among WFRP fans in the impact the game would have on WFRP. Up to 2004, the noises from Warhammer Online were good, with talk of a system based on WFRP but with improved magic and which was skills based. A reasonable model for a possible WFRP new edition, in fact. May 2004 saw a new development in the publishing of WFRP. It has been announced that Games Workshop had given control of WFRP to Black Industries, an imprint of the Black Library. Black Industries have release this press release stating that they will be developing a WFRP second edition, in collaboration with Green Ronin. According to the announcement, WFRP version 2 is expected to ship in 2005, will not be a D20 game (to the relief of many WFRP fans including myself) and will include among other changes (which have yet to be confirmed) a change to the WFRP stat line and an overhaul of the magic system. Mention is also made in the press release of a possible future official Warhammer 40,000 RPG... At the time, there was speculation among WFRP fans of a possible tie to Warhammer Online as both were due to be released in early 2005. June 2004< then saw another twist. Games Workshop decided, almost overnight, to cancel Warhammer Online . The Warhammer Online website and forums were unceremoniously closed for business and a message posted to the site homepage explaining the closure. I took the opportunity to salvage many lovely and useful animations, images and music files from the site (which was simply patched to carry a new home page without links to the rest of the site, and within which page code was still possible to figure out how to access the now hidden images, animations and music). Apparently, even the developers and website/forum administrators had little to no forewarning of the decision. Despite rumours and conspiracy theories of the cancellation being connected to Climax allegedly ripping off GW, the more likely truth seems to be that Games Workshop simply lost their nerve in what for them was a new, costly and somewhat risky arena of business. Simon Butler of Black Industries said that the closure of Warhammer Online will have no impact on the development and release of the WFRP second edition. February saw Black Library release Blood on the Reik, a book of interesting Warhammer art that was probably was first created as concept art for the ill-fortuned Warhammer Online project (many sources hint as such, including the book title on some websites). Blood on the Reik also came out as an especially interesting collectors edition (only 300 copies available). The collectors edition came as a specially bound book tied with ribbon, with a wax seal, containing additional limited availability concept artwork and wrapped in a cloth map of the Warhammer World. My copy is sitting safely and snugly in its box so as to stay in mint condition. :o) Check out also The Loathsome Ratmen, a background book on - you guessed it - the Skaven. On 18th February 2005, two things happened. One of them was WFRP second edition, rapidly becoming known as WFRP2, going into pre-order. Black Industries opened their online store, and WFRP2 was officially available to buy. (What was the other thing that happened? That'd be telling...) As of the current time, WFRP2 was due for release on 18th March 2005, but due to error correcting and possibly other delays was not released until 29th March 2005. The first books for WFRP2 to be available from Black Industries on that date were the Rulebook, Character Pack and Plundered Vaults. The Gamemasters Pack is due later in April 2005. According to SFX magazine: The GM Pack and Empire Bestiary are due 22nd April 2005, Paths of the Damned Vol 1: The Ashes of Middenheim is due 20th May 2005, Old World Armoury: Misillania and Miltaria is due 24th June 2005, Sigmar's Heirs: A Guide to the Empire will be out on 15th July 2005, Paths of the Damned Vol 2: The Spires of Altdorf should be here on 19th August 2005, Karak Azgal: Dragon Krag will be released 21st October 2005, and Realms of Sorcery will be out - again - on 18th November 2005. More on those babies here. I have had time to read and digest the new WFRP2 rules, and had time to think on where they leave both my WFRP game and my WFRP online projects. I hope to update the Goblinoid Project and Warhammer 40,000 Roleplay projects in time to work with WFRP2 - though plans may in store by Black Industries to publish a separate WH40K roleplaying game. My opinion of the new rules is that while I dislike parts of them, they are nevertheless a great improvement on the old WFRP1 system. I am editing a WFRP2 version of my WFRP Index. In 2005 to 2007, Black Industries have published all the above named books, as well as a Character Folio, Game Master's Toolkit, Tome of Corruption (yay! ), The WFRP Companion, Knights of the Grail (a Bretonnian sourcebook), Children of the Horned Rat (about our favourite giant Ratmen), Renegade Crowns (on the Border Princes), Paths of the Damned Vol 3: Forges of Nuln (concluding the Paths of the Damned campaign), and also adventure books Barony of the Damned (Mousillon), Terror in Talabheim (watch the acronym on that one, Del Boy!) and Lure of the Liche Lord. Also released were Night's Dark Masters, Tome of Salvation (on the gods, priests and their magic) and Realm of the Ice Queen (on Kislev). In late 2007 to 2008, Black Industries closed down, and the WFRP license was passed to an outside company once more, Fantasy Flight Games. At last notice, they plan to continue publishing WFRP 2 and Dark Heresy, though there has been no word on whether Green Ronin will contnue to be involved in its development. Their first published title has been Shades of Empire, a book on various organisations of the old world. Also published has been a Career Compendium, a useful book describing all (official) careers yet defined for WFRP2. Also, in 2008, was the launch of Warhammer Online. Not the Warhammer Online that Climax were working on, you understand, but a different one. See, when they closed down the project with Climax, it freed up the license, and Mythic obviously took them up on it. 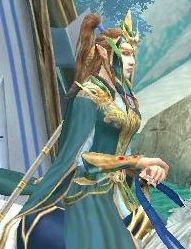 And so it was that Warhammer Online: Age of Reckoning (WAR) launched to a great fanfare in 2008, and winning multiple awards. On the left you can see my Elven Archmage character, and on the right my Dwarf Engineer. Of probable interest to WFRP readers is that, as of 2009, there has been troubled water over the fate of the european roleplaying servers. For reasons of server population, the european english language Roleplay servers were merged (I don't know about the american servers, or the french/german/etc. servers). The OpenRVR/RP servers were closed and their occupants transfered to either pure OpenRVR servers, or pure Roleplay servers. In 2009, there is concern over the Order/Destruction balance on the remaining english language euro Roleplay server (similar troubles seem to exist on the french and german servers also), meaning the last european Roleplay servers may yet close. This would be a shame to those players who, like me, do not wish to see characters breaking the roleplay bubble with names like 'l33tBoy' or 'Nyarlathotep' (I saw a character called 'Yoggsoggoth' on a Core ruleset server - can you say 'Call of Cthulhu'?). 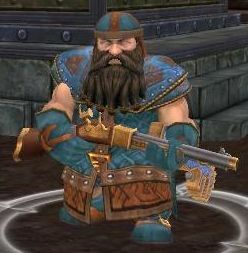 The european Roleplay servers have since closed - there are now no european roleplay servers remaining in the game, though many roleplaying guilds from these servers have largely survived the transfer to the core servers. GOA, who used to manage the european servers on behalf of Mythic, also then gave control of these servers back to Mythic. 2009 also saw Fantasy Flight Games release WFRP version 3. Imagine a game with the familiar WFRP background, but pretty much all the old mechanics gone. As well as this, half the rules aren't in the books, but on various cards - think a card each for every skill, talent, etc. 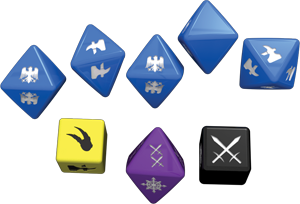 The old D100 dice rolls are gone as well, replaced by a swath of odd custom dice rolled in dice pools. Don't forget also the various counters and the like to represent wounds, etc. It all comes in a box, with enough counters, wierd dice, character cards, etc. to cater for 3 players plus the GM, and costing about �100. Remember, you need these counters, cards and the like to play this game, so no having a fourth player without shelling out for an expansion box with extra bits in it. It's half board game, half RPG. Fans of the new WFRP 3 enthuse, though, that the changes make it better for roleplaying than WFRP 2 (thanks apparently to easier mechanics). What is for sure that it has polarised the WFRP community somewhat, with some loving it - the fans camp - and others just not sold on it - the grognard camp. I have to admit, I'm with the grognards on this one for the time being. Have a look, make your own mind up. I'd hold onto your existing WFRP 2 stuff (or WFRP 1, if you weren't sold on WFRP 2), though - they're not going to print any more of it. Incidentally, you can now complete your collection of WFRP 2 books in PDF format on sites like DriveThruRPG. Warhammer Online shutdown on 18th December 2013. After the game running for a few years in June 2013, Mythic first stopped offering 6 month subscriptions, citing 'lack of interest' in them. Three months later in September 2013, they came clean, said Warhammer Online was shutting down in December 2013, and that three month subscriptions would thus cease to be available. In December 2013, it shutdown, but not before Mythic gave some short time for all players (past and present) to play regardless of their subscription status. I used this time to say goodbye to my most advanced character, Selannied (the Archmage elf on the horse above) in Altdorf before the game went sayonara. On 12th August 2014, FFG officially stopped producing supplements for WFRP3. On 9th September 2016, it was announced that FFG no longer had the license. Warpstone 30 shipped. Fans will know it had a brief hiatus (only 5 years or so...) since issue 29, and a bumper issue 30 was finally published in November 2014. It may have taken 5 years, but it was worth the wait - the size of a regular sourcebook. Sadly, though, it also marks the end of Warpstone magazine. Thanks to John Foody and all of the Warpstone team for the magazine over the years. In approx 2015/2016 - as far as I can tell - a private emulator server began running 'Warhammer Online: Age of Reckoning' again, at least partially. This wasn't Mythic, or anyone with an official license on the game or intellectual property as far as I'm aware, but I believe it's fully legal. They were, however, re-creating the functionality on incomplete knowledge (old packet logs, that sort of thing). Called Return of Reckoning, I would later find out about it in 2018. Check it out. On 27th May 2017, after rumours in January 2017 of Cubicle 7 taking up the license, it was officially confirmed Cubicle7 will be publishing WFRP 4E - as well as a RPG on Age of Sigmar that will use a different rule set. In December 2017, in time for Xmas, Cubicle 7 started to release official PDFs of the old WFRP1 books, starting with the original rulebook, followed by Shadows over Bogenhafen (the Hogshead edition including Mistaken Identity), Death on the Reik, Power Behind The Throne, Something Rotten in Kislev and Empire in Flames. I expect other books to follow in time. 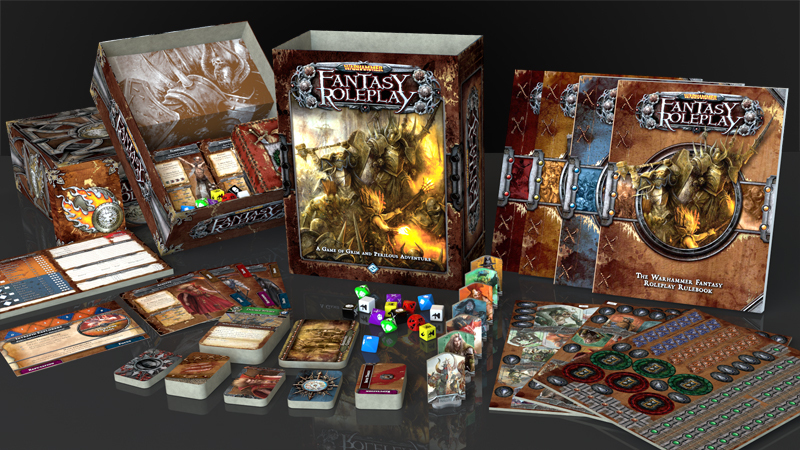 In May 2018, pre-orders were started by Cubicle7 for WFRP4, including a flayed skin leather effect collectors edition. In 2018, I found out about a a private emulator server began running 'Warhammer Online: Age of Reckoning' again, at least partially (currently up to Level 40 and about Tier 3). I think they're still working on recreating the Tier 4 end game (fortresses and capital city capture). Called Return of Reckoning, the game looks just like I remember. Selannied and Reingeld ride again! If you played Warhammer Online before and feel nostalgia for it, or want to see what the fuss was about the first time, take a look.